It is a fact, there are clear differences of feelings between an electric motor positioned in the crank, the front wheel and the rear wheel on an electric bike. In the latter case, it is clear that felt a lot more linear than with a motor crank, marked in particular by a push in the back during a change of speed. If, contrary to an electric motor placed in the front wheel, the one placed in the rear wheel does not suffer from the effect of a skate during a hill start or in wet weather, it also suffers when mounted too pronounced or the need of raises, which is crippling if you are looking for a more sporty of your electric bike. The other disadvantage, a motor located in the hub of the rear wheel request a specific adjustment of the rear derailleur of the bicycle, and this results in constraints on the transmission unit, which reduces de facto the duration of its life. In addition, the combination of a rear engine over a battery on the luggage rack comes to disturb the balance of the masses. Now, the vast majority of new models of electric bikes are designed with a motor crank, or for some with a front wheel motor connected to gearbox type-Shimano Nexus rear wheel. On the flip side, this type of mounting will also alter the ease and speed of repair or even change wheels in case of puncture. In the light of all these elements, what we tell you to choose a VAE with motor in the rear wheel ? 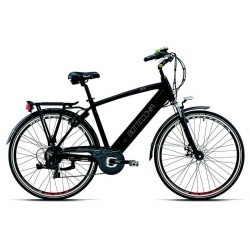 The main advantage, in addition to the motor increased is obtained, resides in the price of the electric bike, much less a model is provided with a motor crank. And this is its main strength, especially in the context of use purely urban.